Snowballs could be sculpted not just out of snow, but also out of synthetic foam, sugar or some other white material. However, for those whose childhood was spent in the former USSR, there is nothing better than cotton wool and starch that were used for homemade Christmas ornaments. 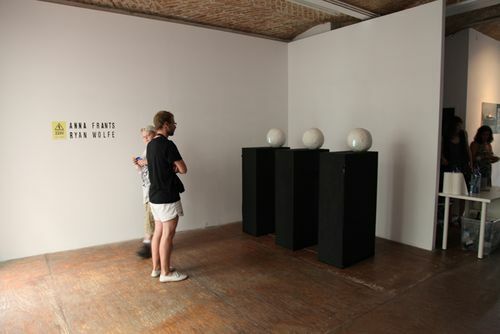 In this installation, thus sculpted snowballs are magnified and placed upon a podium, presenting a monument to child’s plays. 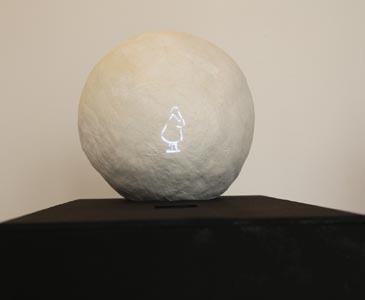 At the same time, they serve as screens upon which the animation of a snowball fight is projected. Being simultaneously an instrument and a process, this work signifies the quintessence of the game in all its manifestations – from “Life is a game of chance” from the Titanic to Kruchenykh’s and Khlebnikov’s Game in Hell where a snowball would not have too many chances.